Sanding is essential for a perfect finish on a new timber floor, and it’s a great way to give an older floor a bit of a facelift and get it looking new again. To get the best finish on a timber floor, you need to make sure you’re using the right equipment - there are a number of different types of floor sanders out there and they all have slightly different purposes. Here’s a quick guide to the basic sanders, and some tips on how to use them. 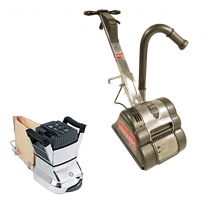 A drum sander does the main bulk of the sanding work and is great for large floor areas. When you hire a drum sander, it usually comes in a few pieces, so the first thing you’ll need to do is put it together. Tighten up the clamp on the right hand side. It’s important that this is really tight – you don’t want it to come loose once you turn the sander on and it starts vibrating. Insert the power cord and twist to lock. Slot the dust extraction tube into the hole on the left of the handle. Take your dust bag and attach it to the dust extraction tube by placing the bag over the open end, wrapping it around and then rolling the rubber ring down to make it secure. Once it’s assembled, you’ll need to install the sandpaper on to the rotating drum. It’s always a good idea to wear protective gloves for this stage, just to be on the safe side. Tuck one end of the sandpaper under the metal plate. Push the metal plate down and tighten the screws to hold the sandpaper in place. Wrap the sandpaper around the drum. Loosen off the screws again and tuck the other end of the sandpaper underneath – make sure it’s as smooth and tight as possible. Tighten the screws again and you’re all ready to go! Tip: The dust bag swivels around so you can move it out of the way when you’re sanding against a wall. Just make sure it doesn’t tear! The edger is designed to get into those awkward corners and hard to reach places. Because it has one exposed edge, it can be used right up against skirting boards and walls. Take the tool that comes with it and unscrew the bolt in the middle. Place the sandpaper over the bottom and reinsert the bolt. Make sure the sandpaper is centred and tighten the bolt. Turn the edger back over. Pierce open the flap on the dust bag. Place the bag over the lug on the left hand side. The edger will only work when you’re depressing the power button on the top. This is a handy safety feature – if you get off balance while using it, just take your hand off the power button and it will automatically turn off. An orbital sander is the last piece of equipment you’ll need for a great result. The orbital sander works by using a rotating pad on the bottom and removes any lines made while sanding with the drum sander or edger. If the handle has been removed during transportation, you’ll need to start by placing it back on in the same way you would the drum sander. Turn the sander on its side. Take the adhesive backing off the sandpaper. Line it up with the rectangular pad and press it on. Lower the cage at the back. Place the opening of the dust bag over the hole and ensure the sleeve is tight. Keep the cage lowered to support the bag as it inflates. To work the orbital sander, you depress the foot pedal and bring the handle down to a comfortable angle. There is an optional weight you can attach if you need a bit more pressure to ensure a good finish (this is especially handy on an older timber floor). Tip: The sander will start sanding as soon as you turn it on. Make sure you start moving immediately, so you don’t over-sand a single spot. Kennards Hire has the experience and know how to help you with your next project. Get in touch with your local branch today by visiting https://www.kennardshire.co.nz/contact-us/. Disposable bag collects debris from floor sander. One bag is included in the hire, additional bags are charged, however you only pay for what you use. 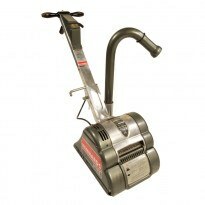 This drum sander is designed for timber floors including parquetry. It is also popular for sanding decking, fibreboard, cork and composition timber floors. A full range of sanding sheet grades are stocked, and disposable dust bags are available. The handle dismounts for ease of transport. The Orbital floor sander is the ideal machine for light, maintenance sanding of pre-coated indoor, timber floors including fine parquet. Popular light sanding applications also include Pre-finished and laminate timber flooring systems, cork and composition flooring. The finely balanced orbital action produces a fine finish to recoat. This sander package is designed for timber floors including parquetry. They are also popular for sanding decking, fibreboard, cork and composition timber floors. Both machines use disposable dust bags. 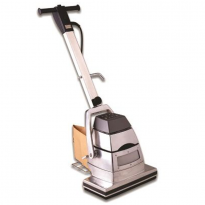 The Floor sander handle dismounts for ease of transport.